The children’s space at Hedberg (WI) Public Library. Photos © Hedberg Library, used with permission. 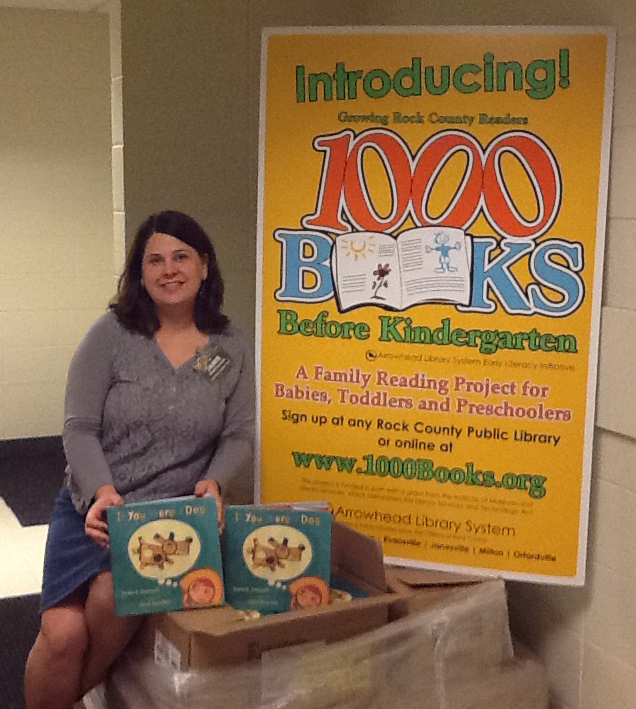 Are you thinking about starting a 1,000 Books Before Kindergarten program in your library? Perhaps you’re already making plans or seeking funding. Get answers to some of your 1,000 Books questions from Upstart’s webinar with Marge Loch-Wouters, our blog posts and start-up guide. Keep reading to learn from one of your peers about how to start and sustain a successful program. 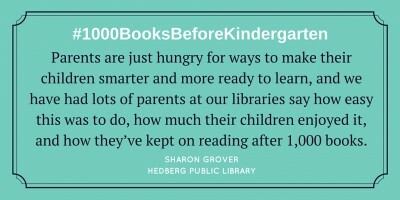 In the following interview, Sharon Grover, retired Head of Youth Services at Hedberg Public Library in Janesville, Wisconsin, shares the genesis of the Arrowhead Library System’s 1,000 Books Before Kindergarten program and describes how community partnerships helped shape its success. Why did you start a 1,000 Books Before Kindergarten program? 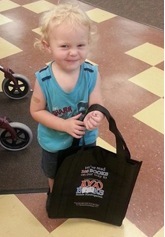 A proud recipient receives a special bag for reading 100 books. We were looking for a system-wide early literacy program to tie our seven libraries together. Many of our colleagues around the country are doing 1,000 Books, and we decided this would be an easy and effective program. We have high poverty rates in Rock County that correspond to low school-readiness rates, and we know that reading aloud to children from birth increases, at the very least, vocabulary and print awareness — two of the building blocks of school readiness. In one of our area school districts, the poverty rate went from 62% to 77% over the past five years. Another district went from 17% to 43% because the GM plant and all of the feeder companies around it closed, and those were hits to the service industry. Our program grew out of a meeting that was held with many different early childhood partners: Head Start; Nutrition and Health Associates’ Women, Infants and Children (WIC) program; Rock County Home Visiting Network; the YWCA; and the Rock County Health Department’s Visiting Nurses Program. A half-day workshop was held to discuss how we could develop a community of practice around early childhood issues. All of these care providers were really feeling the pinch of growing needs of families in poverty. Everyone came to the table and talked about what the needs were — five out of six of the table-top discussion groups identified school readiness as a big issue. Other issues they talked about were helping families find daycare and medical and dental care. It was our thought that, as libraries, we could best help with school readiness. I knew there was early literacy grant money the state had set aside for its Growing Wisconsin Readers initiative, and I thought, how can we use some of that money to help here? 1000 Books seemed like the right answer. Our system is small, so we don’t have a lot of resources, but I knew we could do this. I came up with the idea to do the grant and got a committee together. A committee of library staff from the Arrowhead Library System (ALS) met several times to shape the program and its various components. We designed the program to make it easy for anyone with pre-kindergarten children to participate because all parents and caregivers need information about the importance of reading aloud to their children. In order to reach those families that are not regular library users, especially those living in poverty, we partnered with community agencies such as WIC, Head Start and Early Head Start, and 4K school programs to help us spread the word and get families registered. How did you get funding initially, and how do you sustain the program? Initial funding came from a federal grant from the Institute for Museum and Library Services (IMLS), through the Library Services and Technology Act, administered by the Wisconsin Department of Public Instruction Public Library Development Team. Whew! Our project title for the grant was “Growing Rock County Readers: A Community-based Early Literacy Initiative.” Its purpose was to increase school readiness throughout Rock County by creating a sustainable five-year 1,000 Books program at all of the Arrowhead libraries. Our goal was to enroll 350 children countywide the first year and 1,000 children over five years. We exceeded our first-year goal and we’re already over 1,000 registrants in our second year. We only had funding for one year, but we were fortunate to be allowed to purchase an estimated five years’ worth of incentives and other materials with the grant funding. Incidentals are now purchased by Hedberg Library or the Arrowhead Library System. The goal behind the grant was always to build community and collaboration. Hopefully in the coming year, we’ll be able to work more on building those partnerships, so when one projects stops we’ll have other community partners to work with and make it sustainable that way. For example, the Exchange Family Resource Center and Visiting Nurses are very interested in partnering with libraries because having someone to model reading with the child during the visit would make it more fun. How do parents track the books read? We have paper forms in different colors for each level with 100 leaves to color in. The leaves represent that as a local outgrowth of Growing Wisconsin Readers, we are Growing Rock County Readers through 1,000 Books Before Kindergarten. Hedberg Youth Services Associate and children’s book author Jamie Swenson with copies of her book, If You Were a Dog. Some of our libraries have parties for goals reached or have the children show their progress by putting up leaves for special milestones reached. Since many families have a special bag for library books, each child gets a large bag with the 1,000 Books logo on it after the first 100 books read. At 500, they get a removable window or bumper sticker saying they’ve reached the halfway mark. At all other points, the child gets to select a small sticker from a bucket of stickers. When kids reach 1,000 books read, they get a hardcover copy of Youth Services Associate and local author Jamie Swenson’s If You Were a Dog, illustrated by Chris Raschka, which was made possible by a generous discount from Macmillan Children’s Publishing Group. When children get the book, we make a big deal about the wonderful reading they’ve done and our wish for them to continue reading with their grown-ups. How do you promote your program? Chris Raschka and Jamie Swenson celebrate with the first three 1,000 Books graduates. To celebrate her book Big Rig, Jamie Swenson arranged for a semi-truck to attend our summer library program kick-off, which also coincided with our 1,000 Books launch. This gave us over 200 people at the event, which translated into many sign-ups for the program. We also held a launch party for Jamie’s book If You Were a Dog and were able to bring in Chris Raschka — all we had to pay for was Raschka’s airfare, hotel and food. 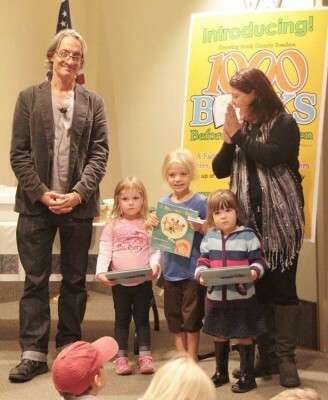 The first three kids to reach 1000 books got to have books signed by the author and illustrator. It was a fun thing for Jamie to do because she’s been so active in early literacy. Jose-Luis Orozco, bilingual educator, children’s author and musician, was in Wisconsin for a book festival, and we had a little extra money so we got him to come to Janesville for a 1,000 Books event, where he promoted the importance of reading aloud with children. He talked to a group of families, many of them who were Latino, about how important it is to read, and he sang and did rhymes for the kids. ALS has hosted Dr. Dipesh Navsaria twice, and he presented on the importance of reading and exploring books with children to promote healthy brain development. He also talked about the importance of community organizations working together to support early childhood development in our communities. Library staff takes 1,000 Books information out to local festivals, food pantries and to the Rock County 4H Fair. We have the brochures and paper sign-up forms as well as the first tracking form. If families sign up at these venues, we enter them in the database back at our libraries. 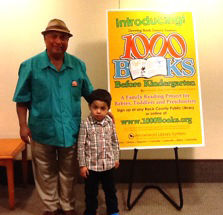 Jose-Luis Orozco and a 1,000 Books friend. We also have tables at events where families are, such as Head Start or other preschools, and at workshops where we might garner support from those who work with children and families. 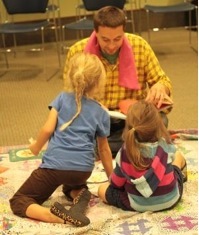 All our libraries do regular storytimes, and this is something that they talk about during their program. We actively promote the Every Child Ready to Read (ECRR) five practices of early literacy and 1,000 Books. When we go outside of the building, we always take 1,000 Books information with us. We’re always preaching the importance of reading aloud to children, so this is a natural extension of that philosophy. How do you leverage partnerships with other community organizations? We’ve been lucky to have very good partners in Head Start here in Janesville and in Beloit. They really latched onto this program when it started. They will bring people into the library to sign up and bring things to hand out and communicate to their families. This is how we get the majority of people signed up. Parents are just hungry for ways to make their children smarter and more ready to learn, and we have had lots of parents at our libraries say how easy this was to do, how much their children enjoyed it, and how they’ve kept on reading after 1,000 Books. We also have connections with WIC, and they sent out 1,000 Books brochures in 1,500 mailings. We go to their waiting room once a month and sign families up, and parents are receptive. We also partnered with Youth Emotional Stability (YES). I now know a whole lot more about infant mental health and I can share that with my colleagues. We did a workshop at Blackhawk Technical College for early childhood educators on the importance of using multicultural books with young children. Child psychologist Dr. Sally McCoy talked about why seeing people who are like you in books and seeing people who are different than you in books are both important. The Department of Public Instruction offered an early literacy course online, and two or our libraries participated and got mini-grants to do early literacy partnerships in their community. In several communities, there are also strong partnerships with local early childhood and 4K programs that help promote our 1,000 Books initiative. We’re also now part of the Department of Public Instruction’s AmeriCorps Play & Read program. We have part-time AmeriCorps members at our libraries, and they are going to be doing more outreach — they’ll go to WIC and food pantries and laundromats to talk to families about the importance of reading. They’ll also model reading with children and how to make those one-on-one connections. That’s really where the change happens — at home — but it’s important to give them the ideas in the library. Two participants receive their copies of If You Were a Dog and sit down to make it book 1,001 on their lists. Babies don’t come with operating instructions. Many parents say things like, “I don’t know what to do to make him grow stronger.” When our families come to baby storytimes, they really are looking for ways to help their kids read and be successful. I don’t think this program is lost on any family. The first year, we registered 768 children system-wide, and now in our second year we’re at 1,237. As a system, the youth services people work together more. In all of our communities, people see us more frequently out in the community. We made great strides in getting community partners to remember that libraries are here. Besides the benefits of having people sign up, that was perhaps the biggest benefit. Families tell us they like the program because it’s easy and they can move at whatever pace suits them. We’ve had some families tell us they really appreciate the book suggestions. Our library associate asks around for suggestions and tries to make sure there is diversity in the lists. Participating families certainly seem enthusiastic about the program. One family shared a picture of their children, ages three and one, actually sitting in their much-loved incentive bags. We had one father of a newborn come in to register his child who was less than a week old. This father had heard about the program and had eagerly waited for his child to be born so he could begin reading to him! 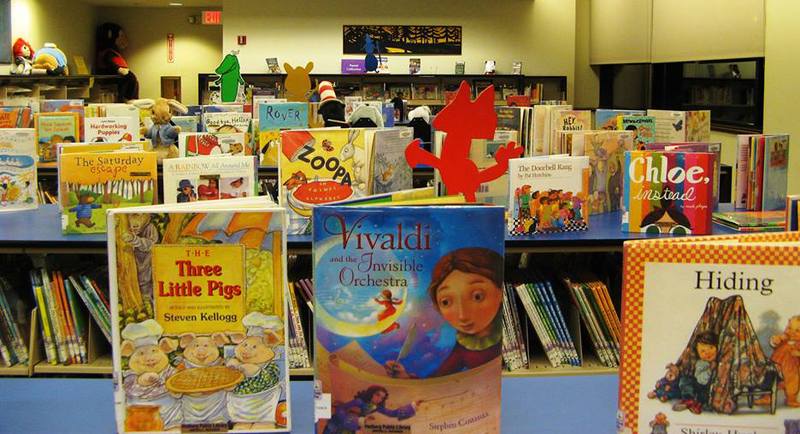 Do you have any advice for librarians thinking of starting a 1,000 Books program? We got our start by looking at Marge Loch-Wouters blog post and googling 1,000 Books Before Kindergarten to see what others around the country were doing. Once we had our goals and framework, putting it together was fairly easy, and we’d urge anyone thinking about doing this to look at what’s out there and tailor it to fit their needs. Sharon is the retired Head of Youth Services for Hedberg Public Library in Janesville, WI, where she worked for nine and a half years. She is a member of the task force supporting Rock County Advocates for Young Children and is passionate about finding ways to link early literacy programming and education with community development. She is also a Youth Services & Audiobook Literacy Consultant and co-author of the book Listening to Learn: Audiobooks Supporting Literacy (ALA). Contact Sharon at sharon.grover@yahoo.com or on Twitter.